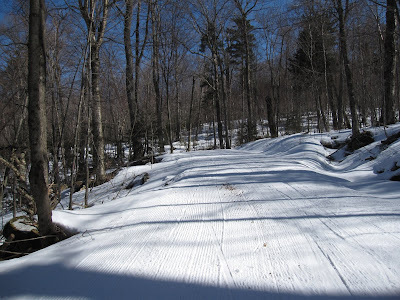 Although it is not officially Spring here in the Northern Hemisphere, it certainly seems like Spring has sprung on the ski trails. Cross-country skiing at Mount Van Hoevenberg has been superb these past two days. The world-class grooming crew has kept up with the trails and challenging conditions remarkably well. The newly-discovered magic grip tape has allowed me to classical ski using my favorite and fast skis, although ski-skating would also be great. This morning's ski, on freshly tilled hard pack with the sun providing just a whisker of warmth, was some of the best of the year. It was "like skiing on velvet," according to the resident poet. The downhills were once again tuck and go for those of us who need the speed, but included plenty of turnable snow for those less inclined to risk a fall. Clear, blue and 42 - it doesn't get much better than that - skiing's great in New York State! If you look closely at today's featured photo, you might notice a sign of who else, besides me, has been using the trails recently.